The Lagos state government says the fuel tanker involved in an explosion on Thursday was carrying “twice its pulling capacity”. Ladi Lawanson, the commissioner for transportation, made this known on Sunday at a news conference in Alausa, Ikeja. 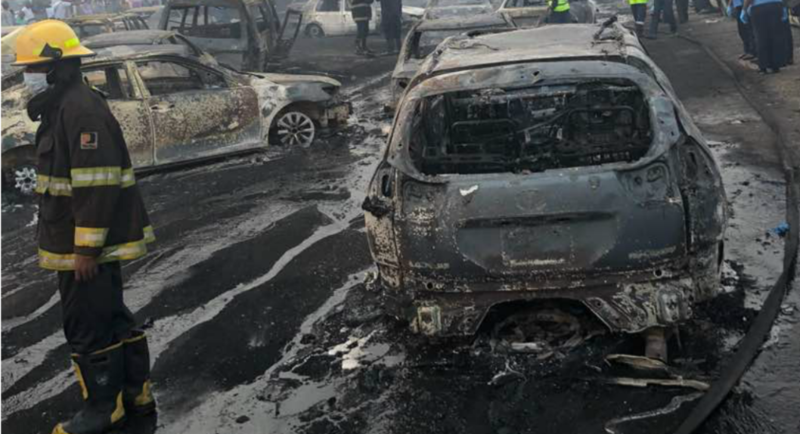 He said the investigation conducted by the state government indicated that the truck involved in the explosion was registered in Kano state and had changed ownership 13 times since purchase. “This truck was designed as a 14,959kg, approximately 15 tonnes drilling rig with low bed but was converted in Nigeria from a drilling rig to fuel carrier to carry 30 tonnes,” he said. Lawanson said a further investigation into the current ownership of the fuel tanker and other related details was progressing. He said facts obtained in the course of the investigation had compelled the review of the legal, economic and social framework of the current management of traffic involving tankers loaded with fuel and other cargoes within the state. Lawanson said the government was also exploring alternative modes of transportation of petroleum products to separate passenger traffic from cargo movement within the metropolis in the interest of public safety. The state government also gave a 30-day ultimatum to all articulated vehicles coming into the state to obtain the ministry of transportation (MOT) certificate of roadworthiness or face sanctions. Fuel tanker drivers were also directed to henceforth ply the designated trailer route; Apapa/Oworonshoki expressway via Ogudu to the Lagos/Ibadan expressway. Lawanson said 10 operational centres had been designated to process applications immediately while new centres would be established quickly on the Lagos/Ibadan expressway to cope with the expected demand for the service. He said the centres include: Berger Ojodu, Odogunyan Ikorodu, Agric/Ishawo Road, Ikorodu, Worksyard, PWD, Shogunle, NCI Gbagada, VIS Yard, Oko-Afo, Badagry, VIS Yard, Ayobo in Ipaja, Test Centre in Badagry, VIS Yard, Epe and VIS Yard, Oko-Oba Abbatoir. Lawanson said the state government will embark on an awareness campaign to persuade all vehicle owners to obtain MOT roadworthiness certificate. He said in 2017, the government upgraded vehicle testing operations and launched the computerised vehicle inspection centres to ensure that vehicles which ply the roads and highways were roadworthy. “This measure recorded positive results. Between April 1, 2017 and May 2018, a total of 178, 267 vehicles were tested,” he said.